you're bound for Poulsbo an antidote to the hustle and bustle of City life, and just enjoy the peace and quite of the Puget Sound. 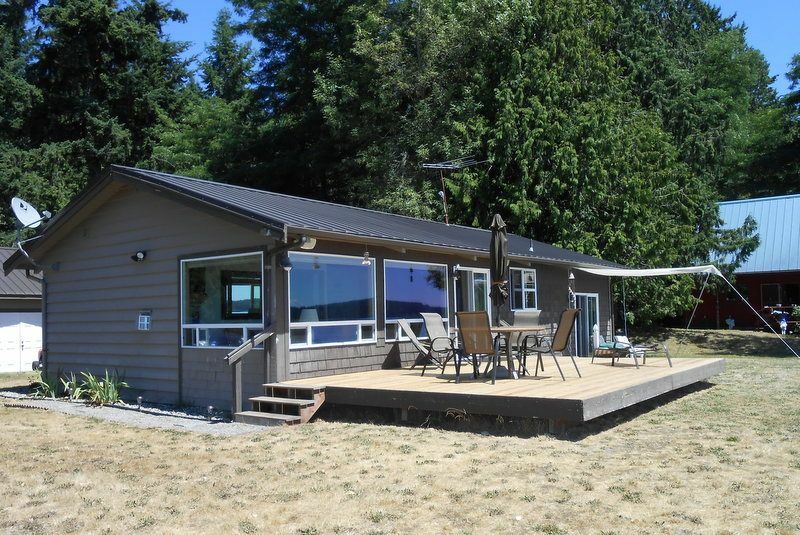 Located in a secluded Bay that you can dig clams, walk the beach, swim or just enjoy the wildlife from the entertainment size deck. Close to the Clearwater Casino, downtown Poulsbo, Bainbridge Island ...Just 20 min. from either the Kingston Ferry or the Seattle Bainbridge Ferry. Convenient to the many activities of the Kitsap Peninsula. The Duncan have been on this beach since 1953. Our family has enjoyed many happy moments with our loved ones (some are now gone) but still part of our land. We are located on a secluded private bay just west of Agate Pass. The only families here have lived here for many generations. Both Bathrooms have a 3/4 (shower) only. All linens provided for all beds and couch sofa bed. 100 ft. of waterfront located in a secluded bay. It was a wonderful stay with my husband, our daughter in law and 2 small grandchildren. A convenient drive to the ferry to explore Seattle and the city of Poulsbo was so cute with art galleries, shops and plenty of family friendly restaurants. We would definitely come and stay here again. From every window there was views of the water. Very comfortable. Hi so glad you loved the place as much as we do. Love to have you and your family back anytime. This was the perfect spot to relax with our dogs for a week while visiting family. Close to the ferry, Poulsbo, and Bainbridge Island but so private and quiet. We will definitely be back! Views for days! The house was perfect for one family or two...the transformation of the house over the years was really cool and the amenities/upgrades were very nice. There was everything you need for a lovely stay and then some. The historical town of Poulsbo is so close and just lovely! Would rent in this house and stay in area again! Beautiful location and wonderful home. This was our second time staying here and it was just as wonderful the second time. The house is so welcoming and the views are spectacular. We got to meet some of the neighbors this time and they were great. Friendly but not intrusive! The only drawback to staying here is you don't want to leave to explore any other part of the area!! But if you do explore it is conveniently located both to the Olympic peninsula and only a ferry ride to Seattle. We will definitely be back again. Clean, comfortable, quiet. Just right for a relaxing weekend away. Even though it was a bit cold we got our 2 year old on to the beach collecting shells and stones. We saw seals, eagles, migrating geese, and baby loved the crabs! I rented the Poulsbo Beach House so that myself and out of state family members could be close to Kiaka Lodge for my niece's wedding. VERY nice and well equiped house, with a gorgeous waterfront setting! I would readily stay here again. Wi-Fi was spotty, but once I found a spot that worked, it was reliable. Donna is a wonderful host!